Q-Games has been delighting gamers for years now with their Pixel Junk line, which has mostly taken traditional genres and given them new life with quirky character designs and graphics and exceptionally refined game play. 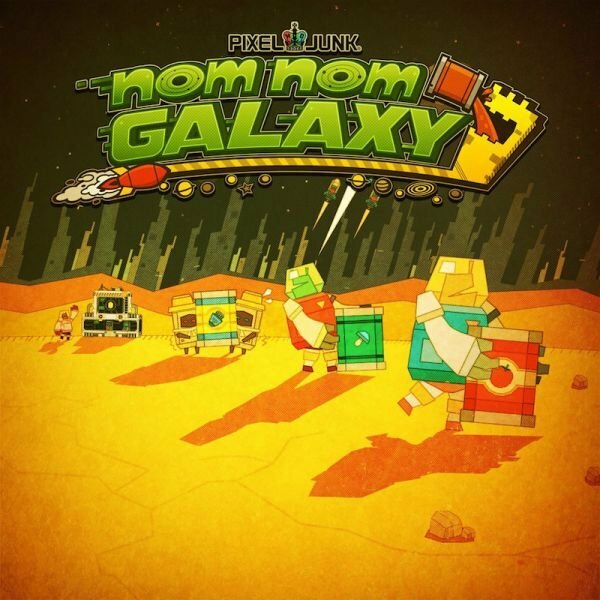 The line is as diverse as it is creative and their latest, Nom Nom Galaxy, reaches new levels as it creatively merges a slew of genres. Nom Nom Galaxy is a mix of the open world 2D mining and exploration of Terraria, with tower defense, and business micromanagement. It’s a strange and seemingly counter-intuitive mix of elements that manage to work amazingly well for the most part. 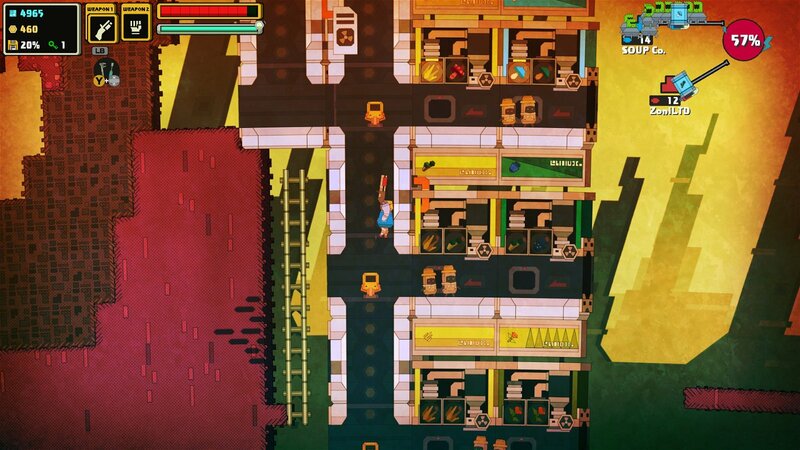 Nom Nom is a distinct departure from most of the Pixel Junk games because there is a steep learning curve and the opening tutorial levels are imperative for understanding how the game works. Compared to the more simplistic nature of Pixel Junk Shooter, Monsters, and Eden, Nom Nom Galaxy is a boldly layered move for the developer. The point of Nom Nom is soup. It seems the galaxy is crazy for the stuff. All the bizarre citizens want soup. New soup, different soup, more soup! There’s one major soup manufacturer, which relentlessly and aggressively defends its market share. As the player, you are just starting work with an upstart rival. Your new robot boss is tough, driven, and doesn’t take well to failure. On the other hand, the planets you’ll be harvesting for soup ingredients can be quite unforgiving as well. 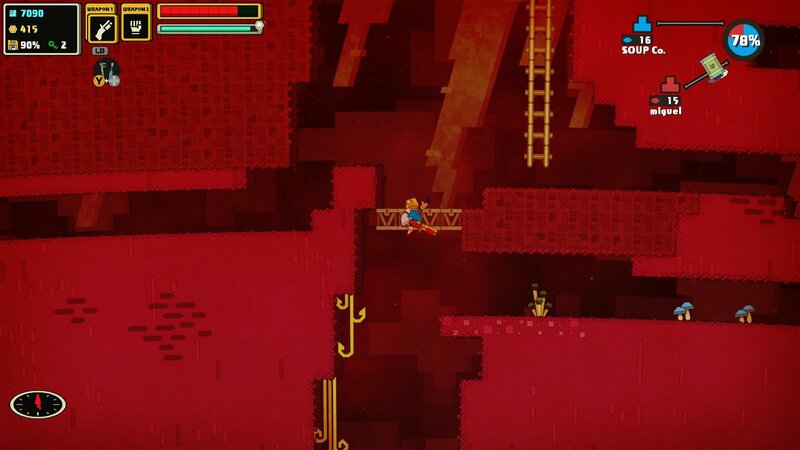 On the surface, the game plays just like Terraria with a far bigger emphasis on base building. Or, in this case, soup factory building. 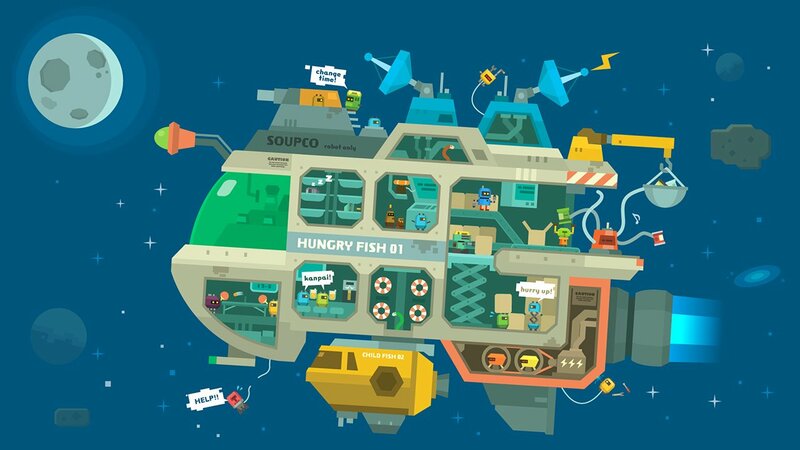 Once past the initial tutorial levels, building an office is the first order of business, then soup making machines that meld two ingredients harvested from the planet into delicious soup. Finally, a rocket launcher is needed to send the soup off world. Past those basic items, there’s a variety of structural and other items to create the ultimate custom soup factory. Corridors, defenses, robot helpers, and more are available to play with. Defenses are key, because once you reach a certain level of market share (100% is the goal), competing soup makers will send in forces to destroy the factory. Should the enemy destroy your office, it’s instant failure. 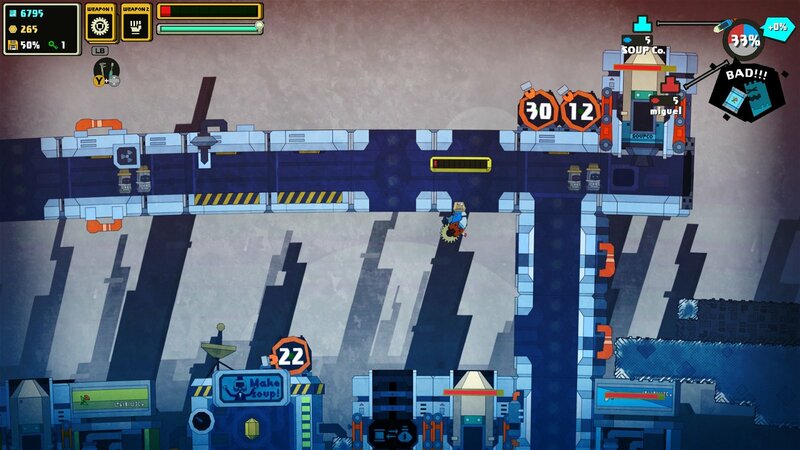 Building, maintaining, and defending the factory is a major aspect of the game, and requires a lot of juggling. But before you can make soup, you’ll need the ingredients, leading to the mining and gathering aspect of the game. The 2D world is a veritable buffet of goodness, thanks to the default spinning blade, all-purpose mining tool, which will cut through dirt, some rock, creatures, plants, and other obstacles. Once a soupable item is mined, you’ll have to truck it back to a soup creator station and keep the station supplied with ingredients when it runs out. Changing soups up is imperative to maximize profit and there are even soup trends to keep up with. 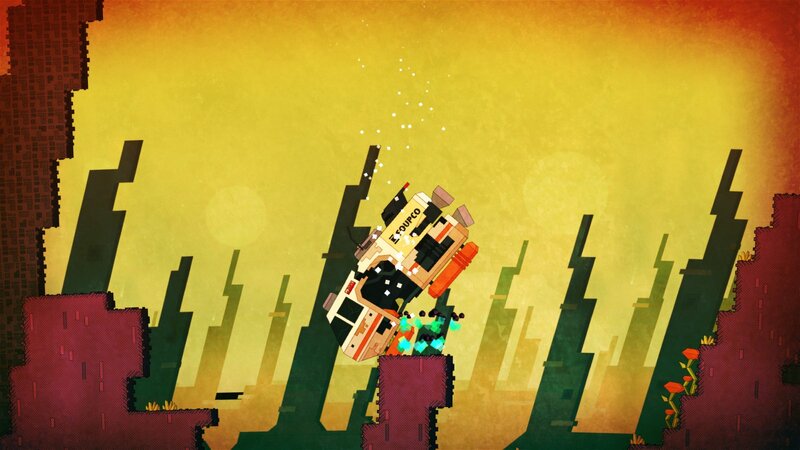 The overall interface and mechanics are more than slightly obscure and hard to master. There’s so much going on during the main missions that things can feel a bit too frantic at times. Robot helpers make things easier by gathering ingredients and sending soup cans to rockets. Yet, they frequently turn out to be highly unreliable. A throwing robot will wait dutifully below a lift tube to throw soup cans up, yet suddenly stop doing its job and instead just ignore everything. Whether this was a glitch or simply the result of some unknown mechanic of the game, it causes a lot of over-working for our poor soup maker. For those who prefer a more leisurely pace, each main level also includes a sandbox mode that isn’t tied to the overall story mode. This style of play will likely prove more appealing for Terraria and Minecraft fans, because it gives the player time to really explore the giant maps. Since the main missions are so focused on quickly attaining market share, exploration for the sake of exploration goes to the wayside. There are also leaderboard-tied competitive modes that will change regularly. These events include races, timed destruction and soup making, and frequently support multiplayer. The game supports up to four-players online for both competitive and cooperative soup-related activities and two-player local coop as well. 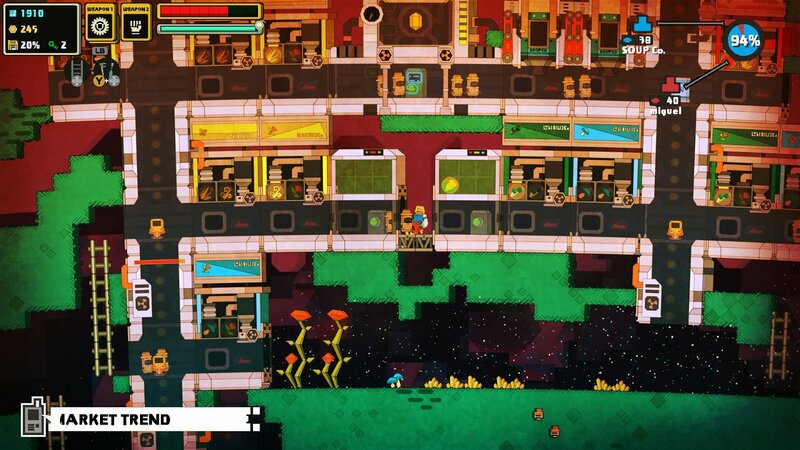 As usual for Q-Games and Pixel Junk in particular, Nom Nom Galaxy has a very retro, colorful look. The map is made of blocks, has an excellent physics system, and a lot of the cause and effect elements of Shooter. Mining under unstable ground can lead to crushing landslides, water can be drained from one pool to another one with clever tunneling, oxygen pockets will spread, and there are a host of exotic ingredients and soup combinations to discover. 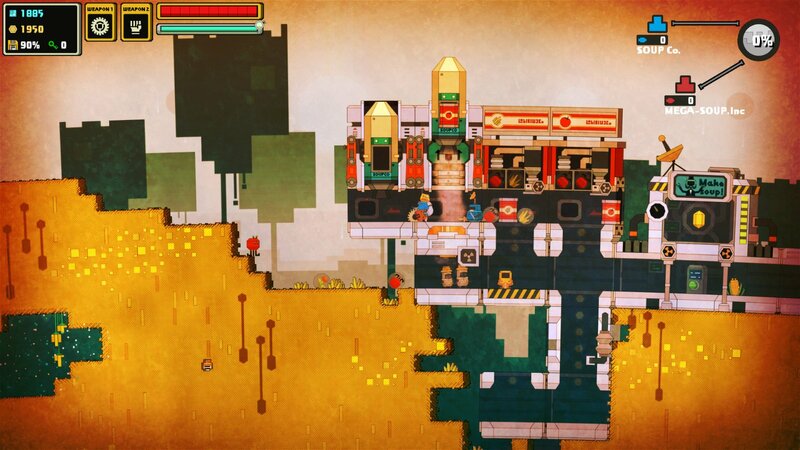 Despite the learning curve, Nom Nom Galaxy still feels very much like a Pixel Junk game. It’s fun, frantic, and creative. While there are some uncharacteristic interface and game play issues for Q-Games, the overall effect is another terrifically original take on a variety of genres. Nom Nom Galaxy is a mix of the open world 2D mining and exploration of Terraria, with tower defense, and business micromanagement.